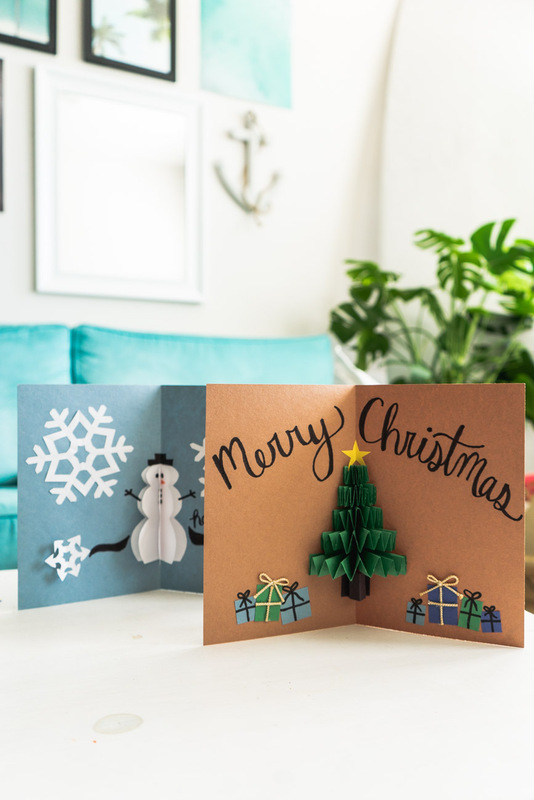 A DIY pop up card is a fun take on original Christmas cards. Havn’t you noticed how the pop up cards in stores sell for a premium price compared to the regular cards? People love them! And for good reason, it’s fun to open a card that pops up. 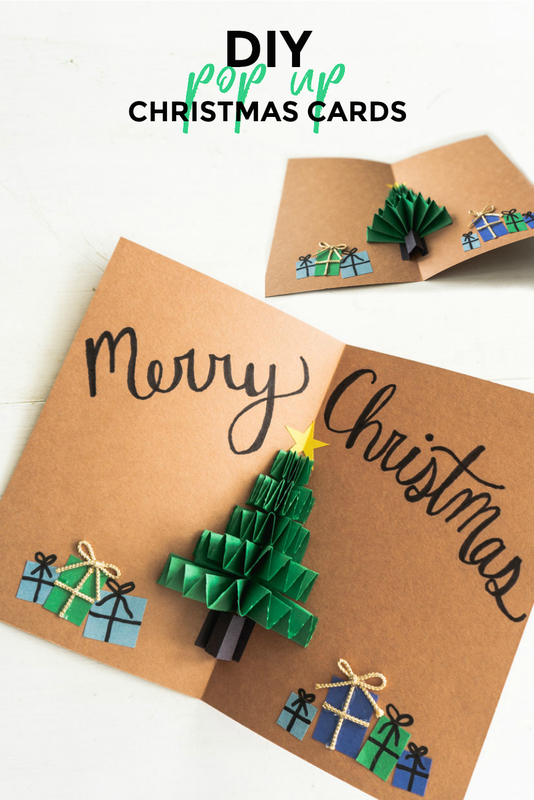 These pop up Christmas cards are easy to make and take a few supplies you probably already have on hand (I did). It’s a great way to customize a card and make it special for someone. 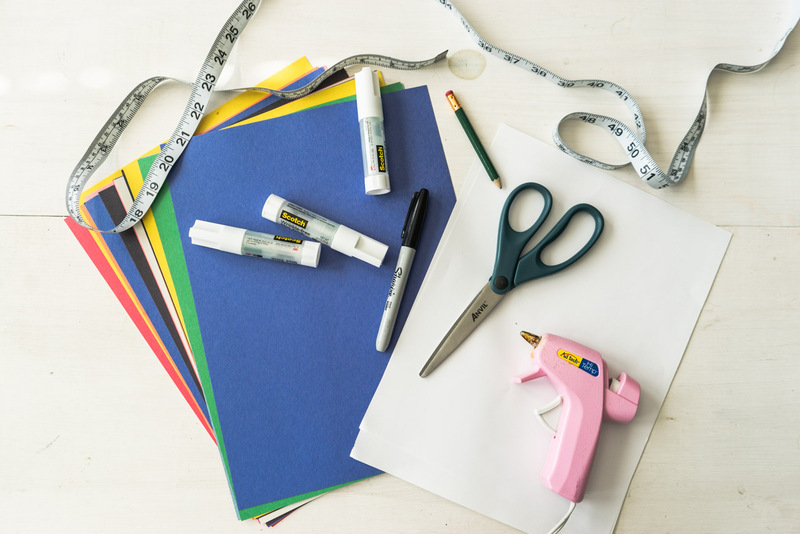 Instead of going out and buying a card, you can use supplies you already have so that you’re being less wasteful too. These Christmas cards are guaranteed to make your mom go “awww” or your grandpa hang it up on display. 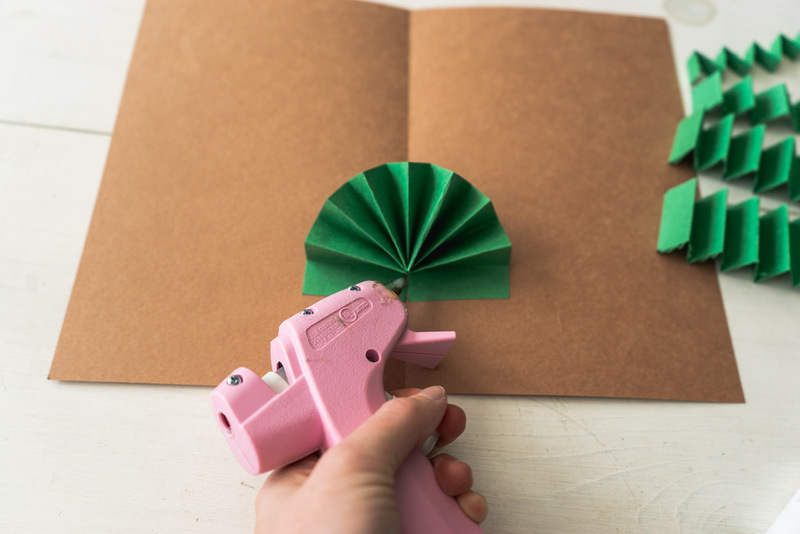 It’s a great craft to get your kids in on since it’s so easy. You can bet I’ll be having my future kids DIY these cards one day. 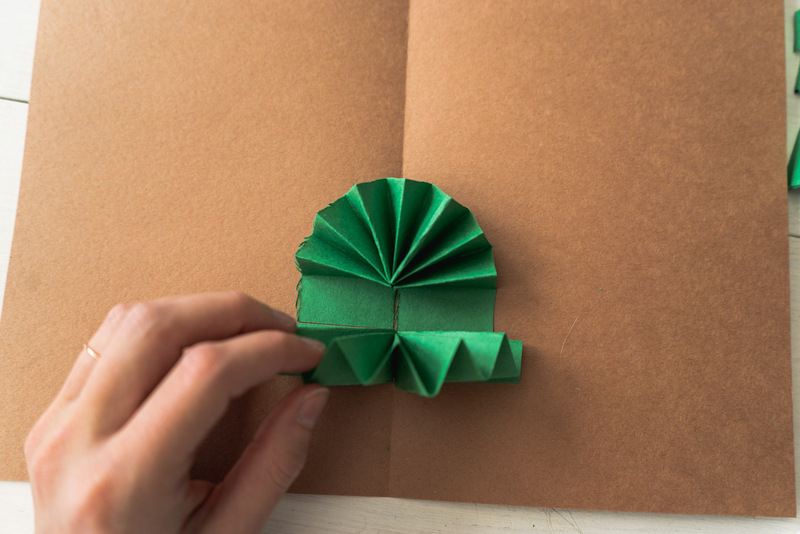 Take a piece of green paper and fold it like a fan or accordion. Follow the photos to make it. 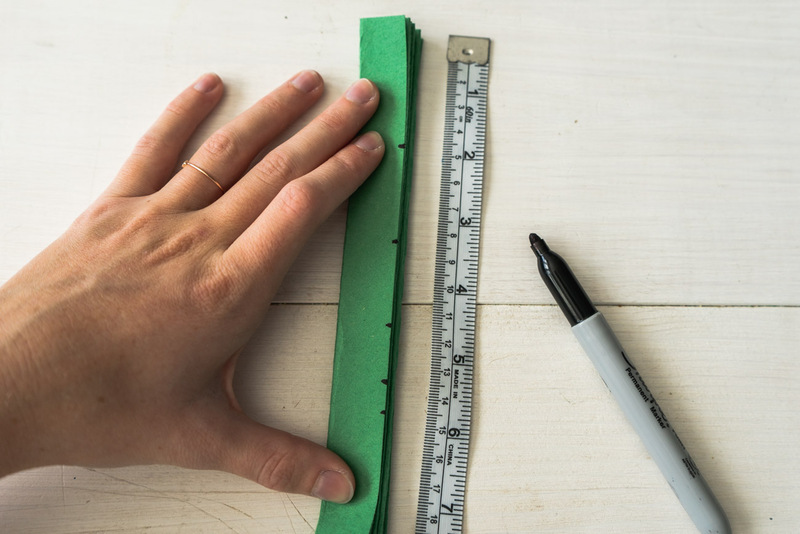 Once that paper is folded up, cut it at 5 centimeters, 4 cm, 3cm, 2cm, and 1cm. 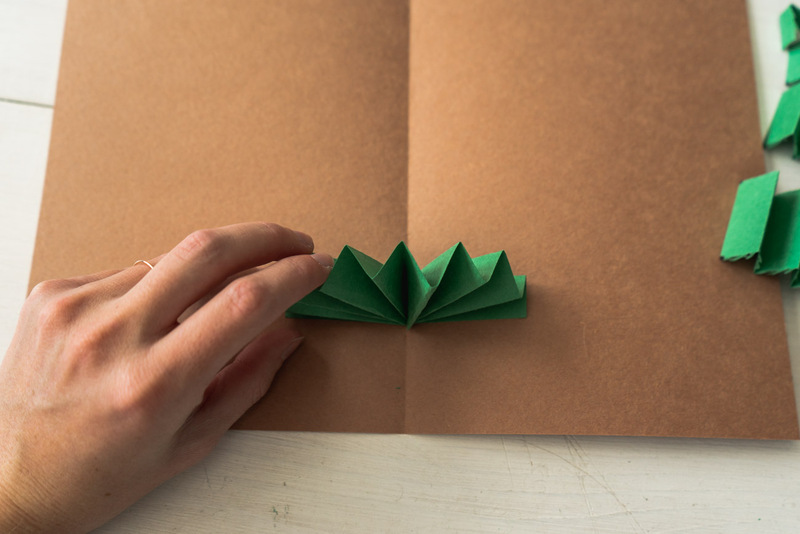 Make sure the pieces end with flaps pointing in the same directions. Taking a new piece of paper (I suggest brown or blue) fold it in half to be the card. 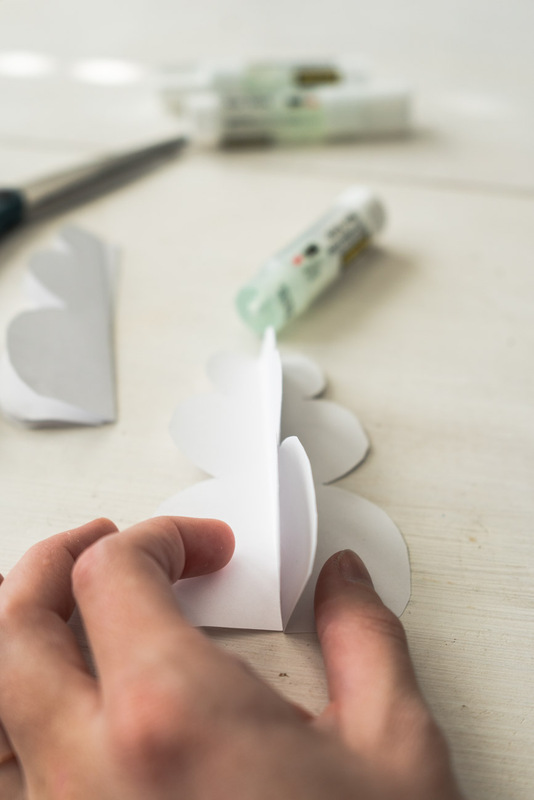 Starting with the 5cm piece (which will be the tree’s bottom), glue the last flaps horizontally to the center of the card. It will create a fan/rainbow effect. Place a line of hot glue in the middle to secure that the piece won’t pop completely out. 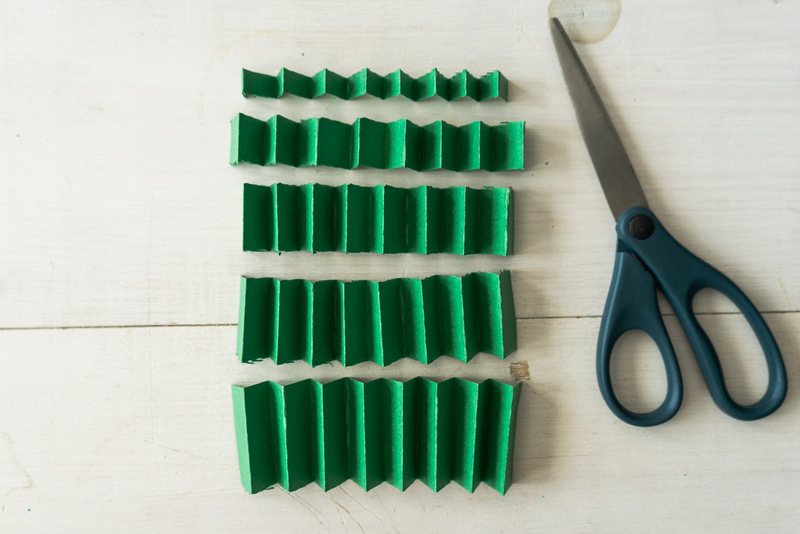 Repeat this with the other green pieces, placing them above the one before. It will go 5cm on the bottom, 4cm above, 3cm, 2cm, then 1cm, making a tree! Cut out a star and fold it in half. 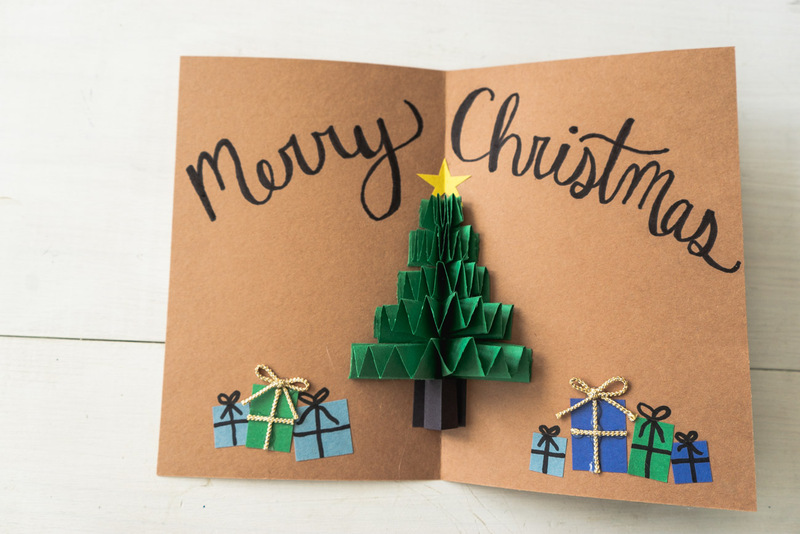 Glue it to the top of the tree in the card fold. 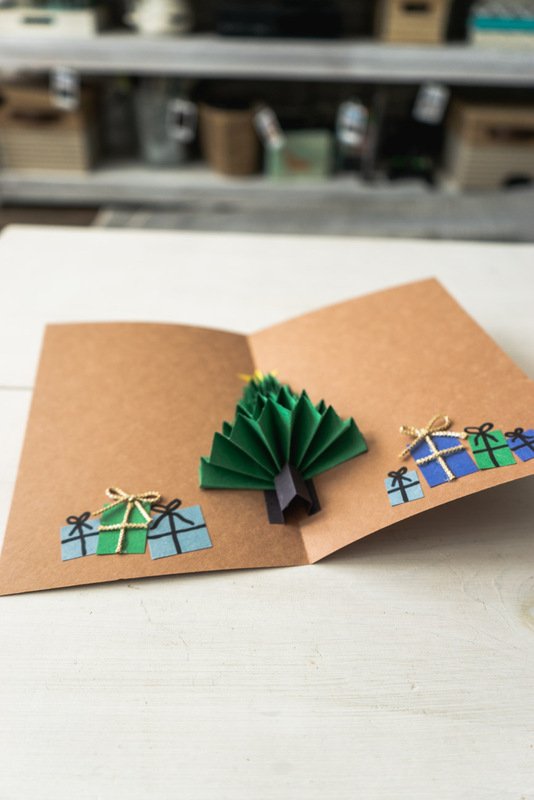 Then cut out a rectangle of black or brown paper and fold it in half, then fold the edges in and glue those edges on the card to be the stump of the tree. 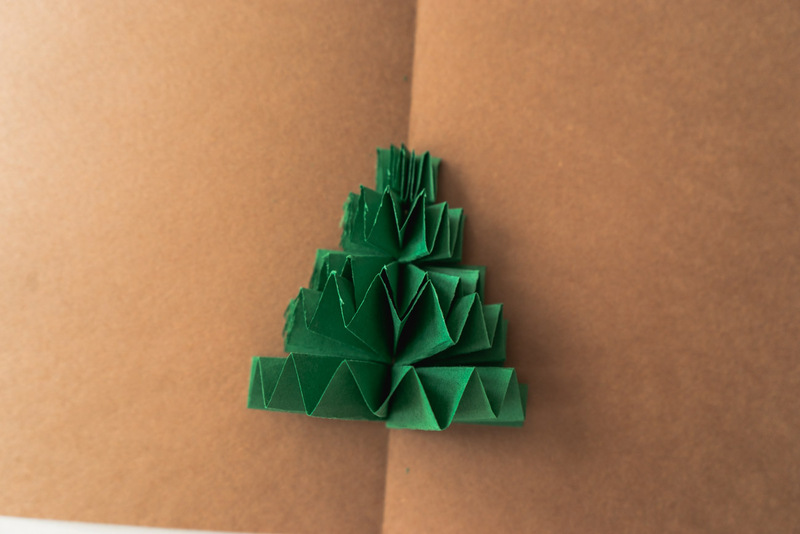 Cut out squares and rectangles for the gift boxes and then glue them down under the tree. 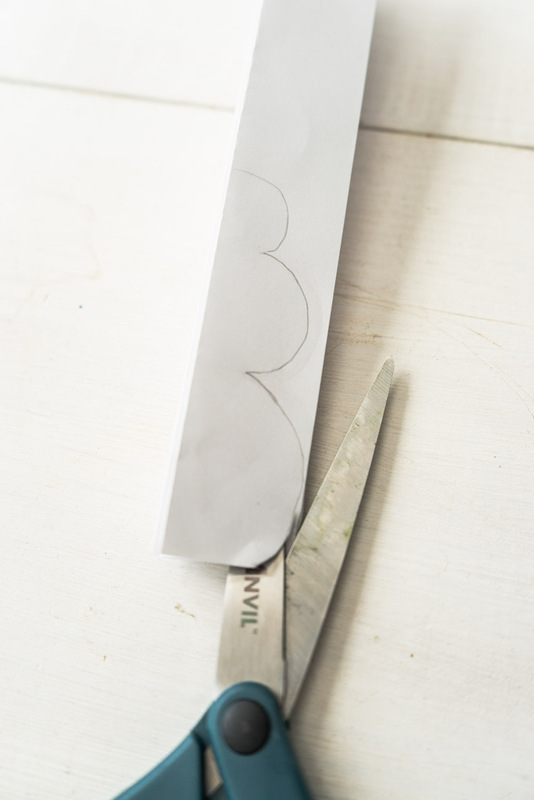 Draw ribbon and bows on the boxes. 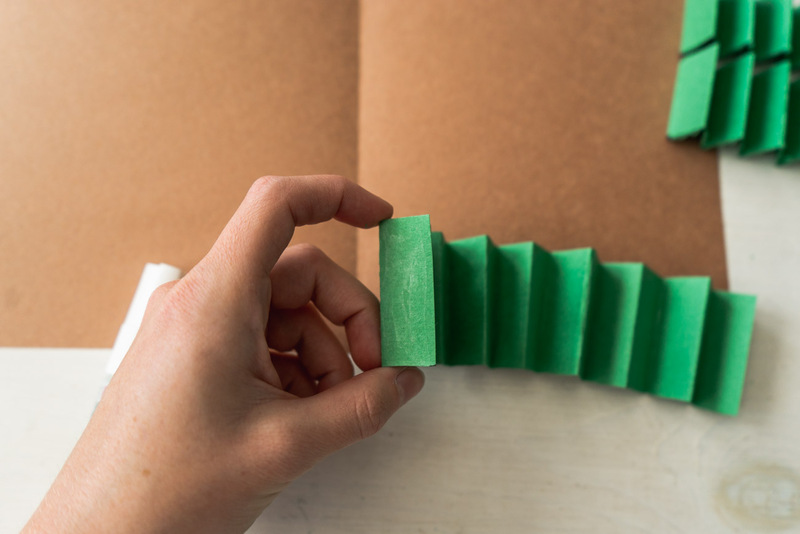 You can make a few 3D by putting string on the boxes and gluing it down. 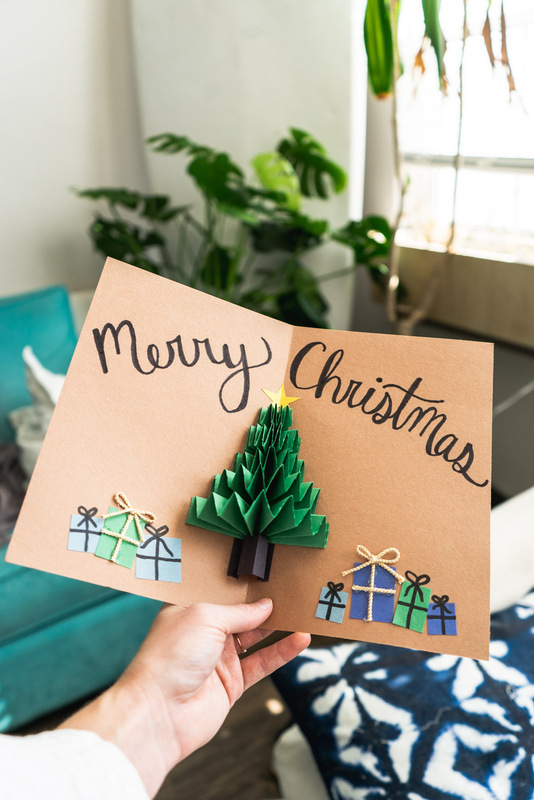 This DIY Christmas tree pop up card is really easy to make. You could also do the tree in white paper and add snowflakes around it like it’s outside. Or you could decorate the tree by adding different colored dots on the branches. It’s really easy to make it unique and add your own little touch. Next up is a different version of Christmas cards that can also double as regular ole’ holiday cards if you don’t celebrate Christmas. 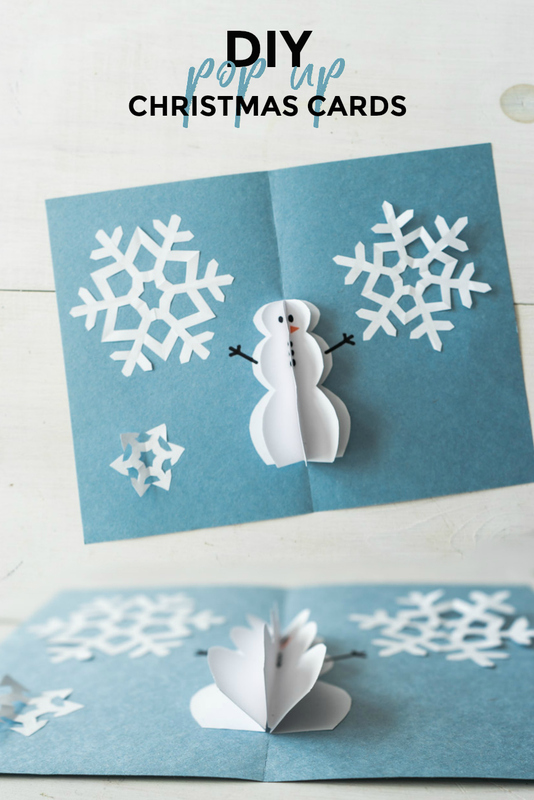 It’s a snowman card! Complete with snowflakes and all. 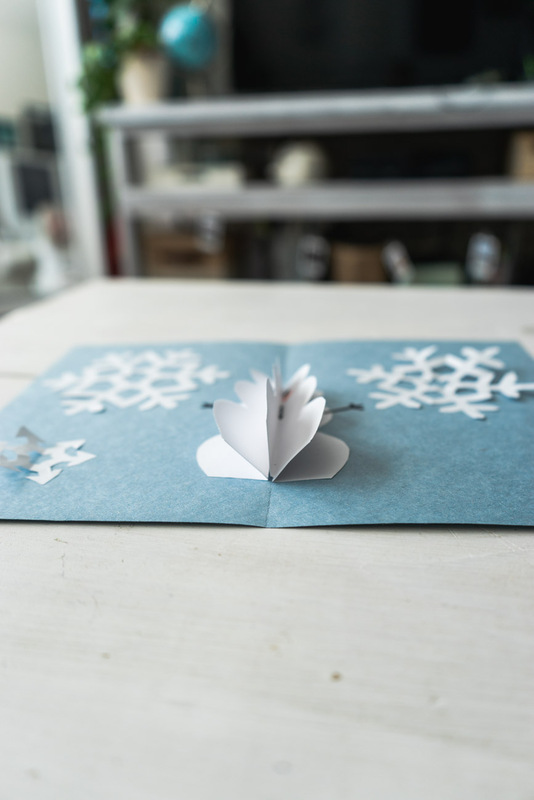 Follow this guide for how to make the perfect paper snowflake. 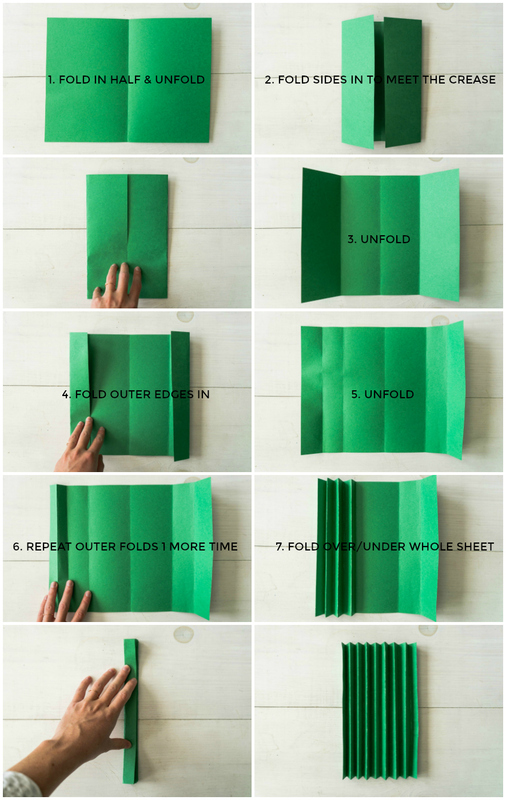 Fold a new piece of copy paper like the Christmas tree card, into an accordion but with 1 inch folds instead of 1cm folds. When it’s folded up, cut out a half snowman shape on one side of it. 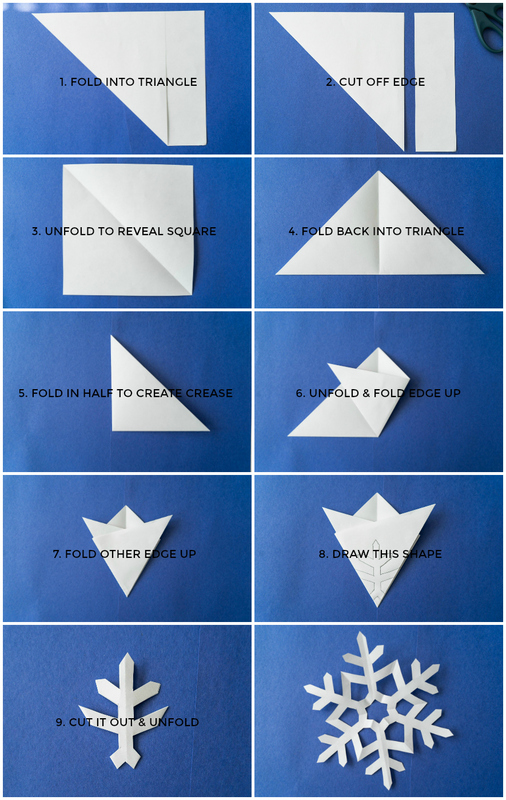 Unfold to reveal a pop up snowman! 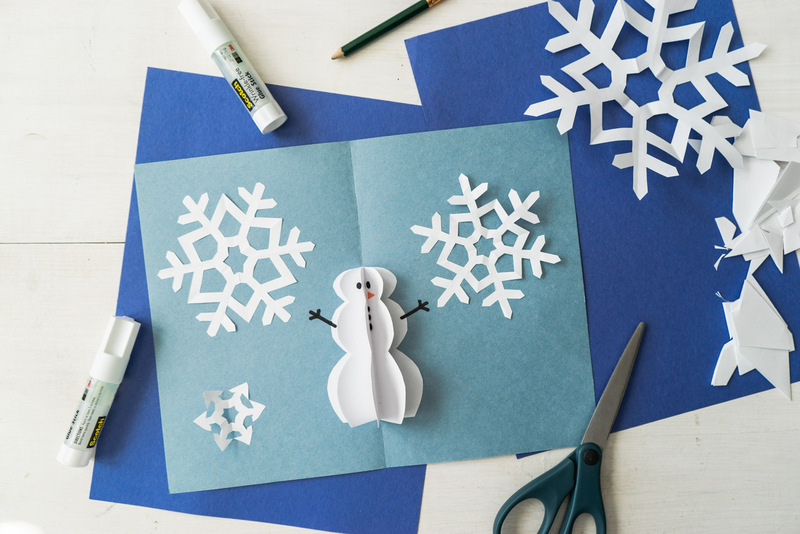 The pieces will need glued together since when you cut the snowman out, it cut on the fold line to keep the paper together. 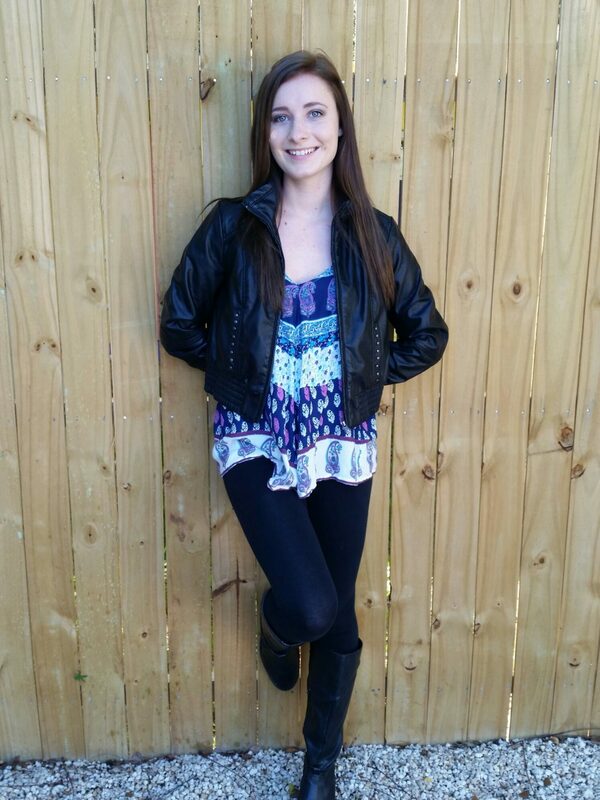 Just take a glue stick and glue the pieces that fell apart to each other. 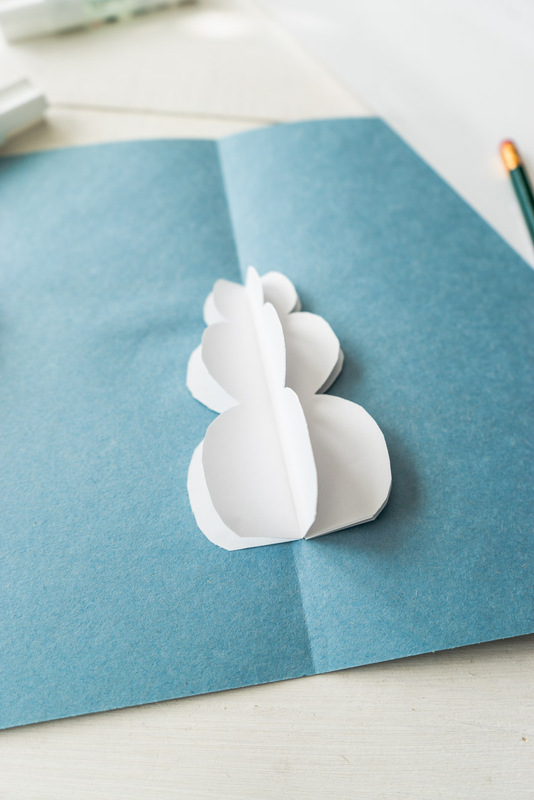 Then glue the outer flaps of the snowman down to the center of a piece of paper folded in half to be the card. 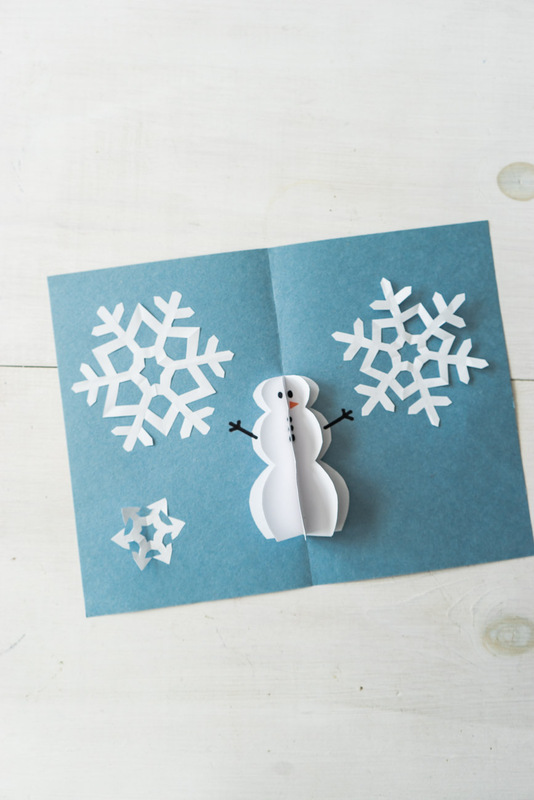 Add black dots as buttons to the snowman and cut out a little carrot nose from orange paper and glue it on one of the flaps so that you can see it. Draw arms and a hat if you want and whatever else to make your snowman unique! You could give him gloves, a scarf, or a mouth. Then glue your snowflakes around the snowman. 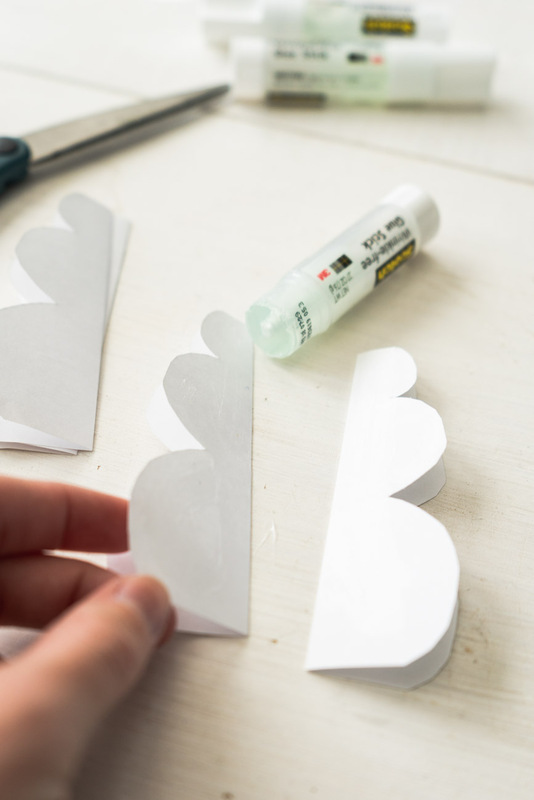 Only glue one half of each snowflake down so that they pop up too! 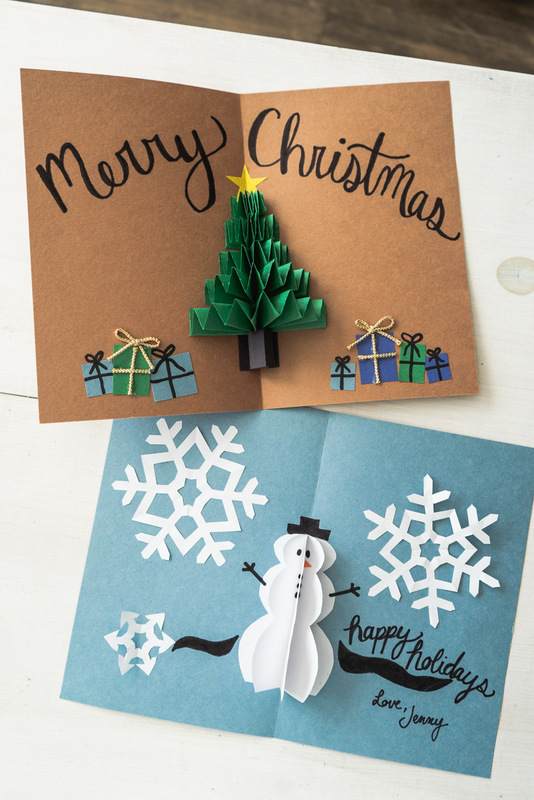 These DIY Christmas cards that pop up are so fun and unique. You can get however creative you want, plus include the kids! It’s a special take on holiday cards to give to the special people in your life. Everyone loves things that are handmade. It shows how put the time into the gift and didn’t just stop by the store last minute. 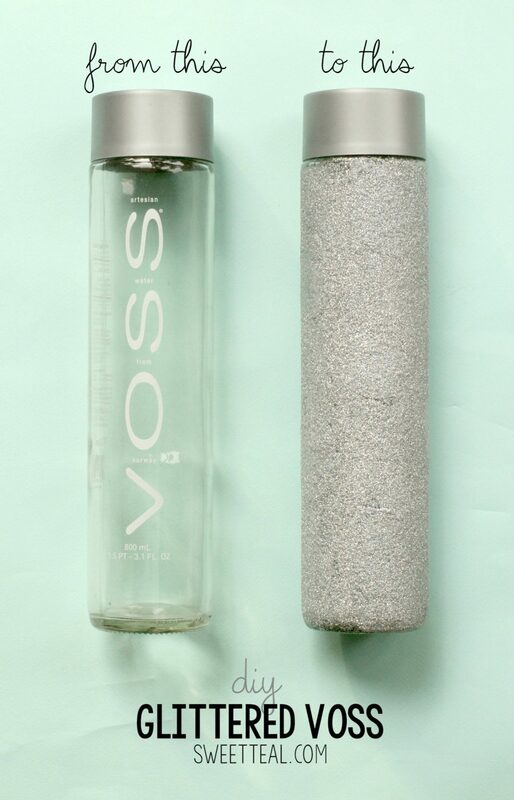 Plus, handmade gifts are one-of-a-kind! 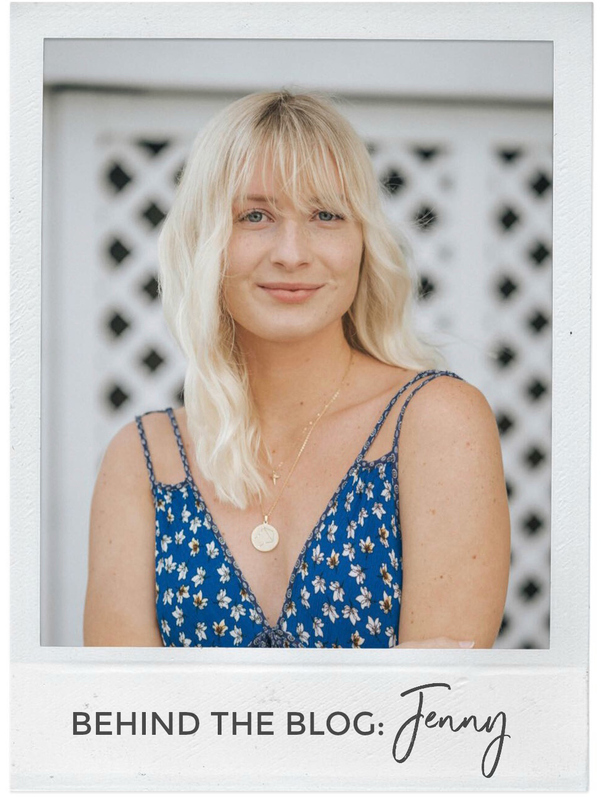 If you want to include a little something else with your card, make some sugar scrub, tassel earrings, or a custom hat! 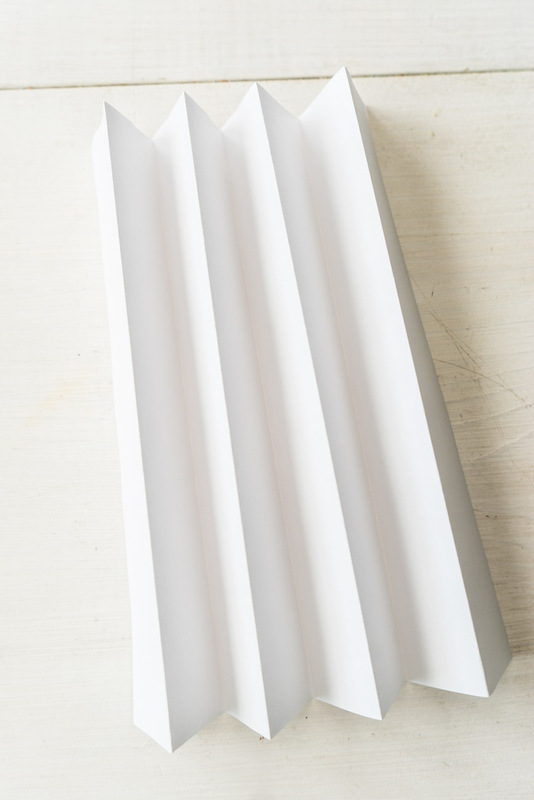 Some great gift ideas for beach lovers are DIY seashell towels or some seashell candles. Whoever is receiving your gift will love it. After all, it’s the thought you put into it that counts.